I love good old fashioned American food. Burgers, fries, onion rings, and hot dogs are my definition of American food. If you are in Spartanburg, SC then you need to visit Beacon Drive In. The Beacon Drive-In has been around since 1946 and is well known in the south as the place to stop if you’re in Spartanburg. Well, I was on a road trip this weekend to West Virginia and we passed through Spartanburg. 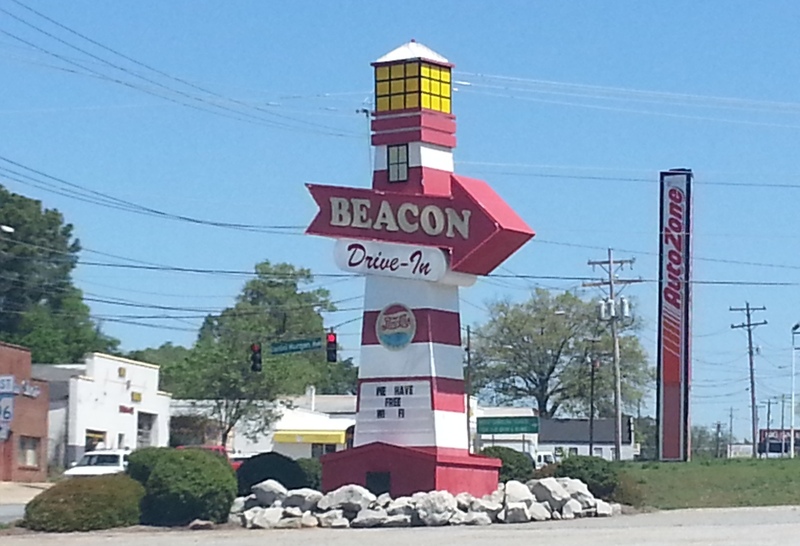 One reason I know about the Beacon Drive-In is because our church youth group (of whom my daughter is a member) stops here every summer on their way to summer camp in North Carolina. So for years now I’ve heard her tell me how good the food is there. Now it was my turn to try it myself. 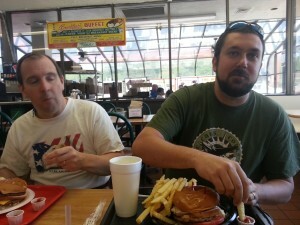 As we approached Spartanburg I informed my travel companions of the reputation that the Beacon has and they agreed to give it a try. It didn’t hurt that there was a Geocache in the parking lot. We got there around 11:30am so the place wasn’t very crowded. The first thing I noticed was the man at the counter yelling. He was the “caller”. Basically you tell him your order and he yells it out for the other folks to fulfill. This is similar to The Varsity in Atlanta. This part worried me a bit because I am a bit particular about my burgers…no condiments, lettuce, or tomatoes on mine. But upon looking at the menu on the wall, I found what I needed…the Chili Burger. 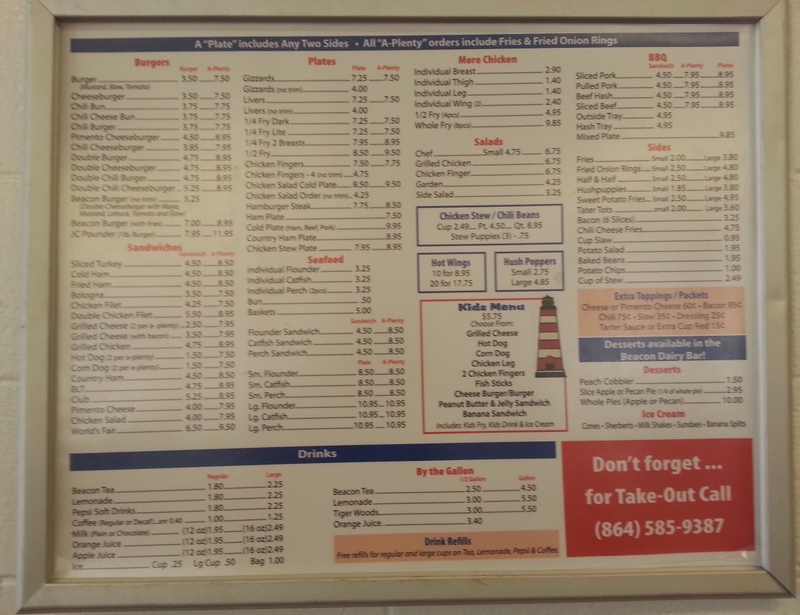 I stepped up to the menu and was promptly yelled at….I quickly told him my order and I ordered it “aplenty” which means you get onion rings and fries with the order. I then moved down the line and my food came very quickly (roughly 20 seconds) then I grabbed a sweet tea and paid for my food. My chili burger aplenty with sweet tea was around $10. That might seem a bit high but the amount of food was staggering. I have to say that the burger was amazing. 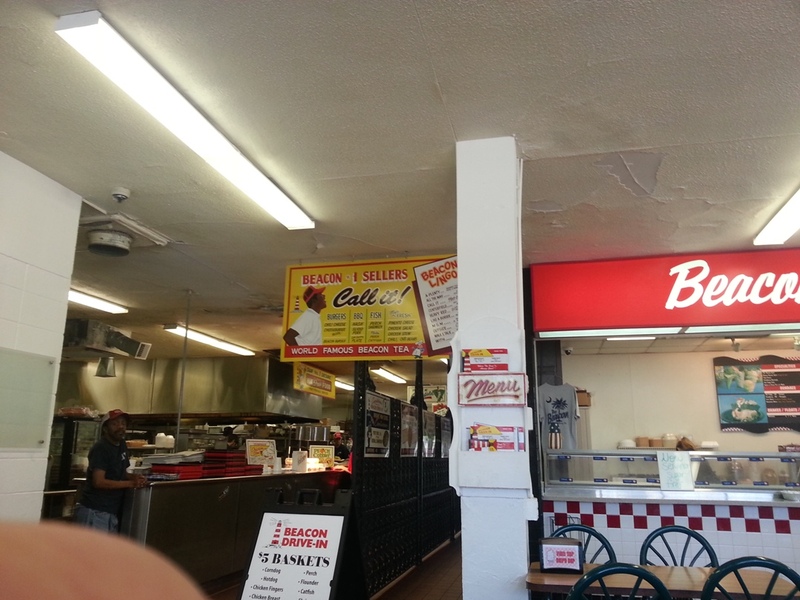 I had the chili burger and the Beacon Drive-In did not disappoint. It was large and it was good. The onion rings and fries were very good as well. 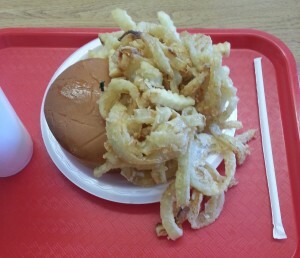 The onion rings were a bit fried to pieces….but they were still very tasty. The only negative was the sweet tea. I’m from the south, so I am a bit of a sweet tea snob. This was not southern style sweet tea. I honestly think it had lemonade in it. Some people love it…it wasn’t for me. A couple of the guys at my table got the Beacon burger which had cole slaw on it and was two patties. It was a monster. They couldn’t even finish it but they said it was awesome. Some people may be turned off by the casual atmosphere with all of the yelling. But I loved it. It feels like home and you are just comfortable the entire time you’re there (except maybe when you’re ordering). The restaurant seemed clean and it began to get packed with customers when we were leaving. 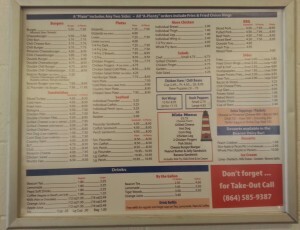 If you’re ever in the Spartanburg area I highly recommend you stopping by and trying out the Beacon Drive-In. My husband would love this place. Too bad we didn’t know about it until now- we drove through Spartanburg on our way home from Charleston a few weeks ago! I love old-time dinners like this one. And shouting the orders just adds to the charm for me. Its comforting when you can actually see the people preparing your food, ya know? My brother worked at one where we grew up in Michigan and it was always packed. Good old American food can’t be beat! 8.3 that is a nice rating you gave. I really like older diners compared to those high tech ones.. I like old diners. I love onion rings but I like min a little bit more formed. I think your rating sounded good. 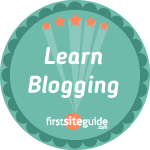 May I ask what plugin you are using for your ratings I really like that? Yes, I thought the onion rings were a bit cooked to pieces…would have preferred them a little more intact. Not sure about the plugin, it’s actually built into the theme.